Swing doors | Uniflow International Pte. 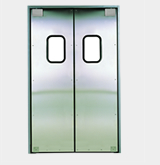 Ltd.
UNIFLOW’s SWING DOOR opens with a light touch of a finger and closes automatically in a safe and gentle motion. ・Act as visual and thermal separation, as well as sound abatement between retail space and backyard. ・Air-tight gaskets can be equipped to control temperature in refrigerated rooms. 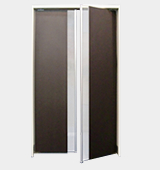 As well as prevent unwanted wind, dust and even sound. ・Variety of surface finishes is available to suit the interior of your store. 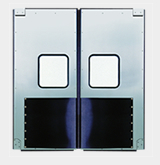 UNIFLOW’s SWING DOORS are known for its durability and long product life, needing almost no maintenance. Made from environmentally friendly materials which can be recycled. Perfect for the environmentally conscious customers. The door is tailor made with it’s unique designs and specifications for each models. The door can be in single swing or double swing based on the site opening dimension. There are few option parts can add on like a spring bumper, a hand plate and a colored sheet to suit for site operation and requirement. Please see each model page for more details of products and CAD download. 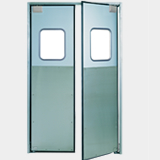 The upper and lower components are shifted non-vertically for the hinge used for SWING DOOR. The door rises to open obliquely upward and then returns to the original position using its own weight. UNIFLOW’S SWING DOOR uses neither springs nor hinges. 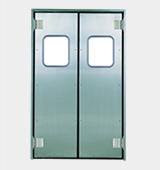 It has a no-spring mechanism consisting of UNIFLOW’S mechanism utilizes an inclined offset shaft, that works on the weight of the door alone without using electricity. A wide range of options. Our dedicated sales, service and support team will deliver as well as customized solutions for such as windows options, reinforcements(bumpers), and hand plate that best suits your specifications. Our best selling models that cater to a variety of facilities. The air-tight improves the energy efficiency. 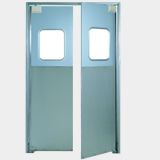 Aluminium SWING DOOR made of one metal plate. Light and low cost, suitable in small stores. Whole surface aluminum model. It is ideal for sticking a tack sheet without use of screws. Washable and perfect for sanitary facilities. 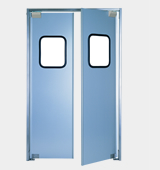 The new generation of SWING DOOR. The most durable and heat insulating model. 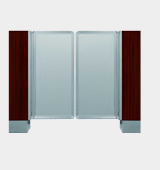 With V-hinge, it provides excellent durability against wind impact. 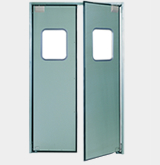 Durable, light-weight and economical low counter swing door. New model that incorporates functionality and design. Ideal model designed for loading docks and forklift usage. Copyright　UNIFLOW Co., Ltd. All Rights Reserved.